Venue: The Collections Resources Centre, Barrow-upon-Soar, Leicestershire. We are excited to offer you the chance to visit the Collections Resources Centre, the home of the Fashion Collections held by Leicestershire County Council. 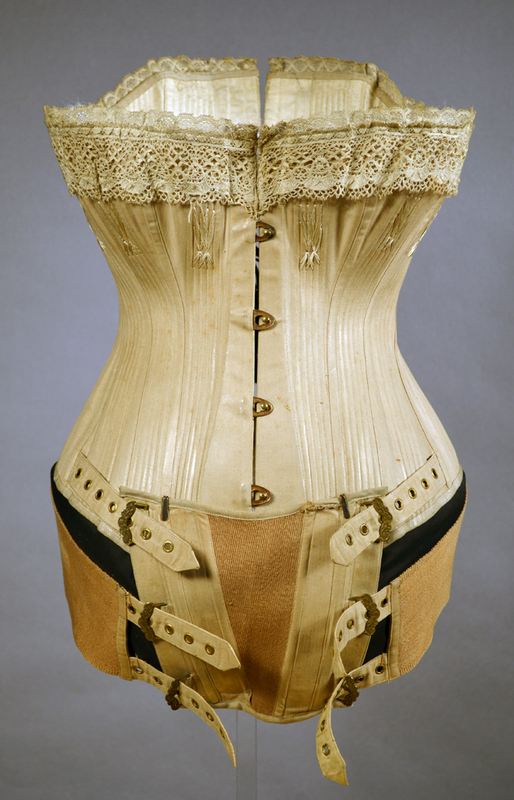 The visit will give the participants the chance to view and study a selection of corsets, c1885-1910, from the Symington Archive. The session will allow you the opportunity to see and feel original historic corsets that normally you would only be able to see behind glass. This session will be fantastic for anyone who is interested not only in the history of the corset, but also in the construction of this unique garment. The visit will enhance your practical knowledge of how historic garments were constructed, the combination of fabrics used and structural techniques that can only be seen if you can open the garments up to view the internal structure. Please be aware that the collections and study room are situated on the 1st floor and are only accessible by stairs. Due to space restrictions refreshments will not be available on site. Lunch is not included in the price but there is a pleasant pub that serves light lunches and refreshments only a 5 minute car drive away. If anyone is interested in meeting for refreshments, please email or call me for further details. Directions will be sent out when booking has been confirmed.